I recently had the opportunity to drive a shiny BMW around Seattle. Unbeknownst to the guy who drove up next to me and gave a confused look when he saw a beanie-wearing, 25-year-old woman behind the wheel of a BMW, I do not own this car. Rather, I borrowed the car for a quick drive around the city—something Seattleites can do now, thanks to ReachNow, the new BMW car share service. That’s right—you can now rent a BMW for .41-.49 cents per minute and get around town in style. Have a hot date you’re looking to impress? Need to move a bunch of boxes across town? Move over, tiny Car2Go, there’s a new car in town and, get this: it seats more than two people! While Car2Go is great for quick trips from point A to point B, ReachNow offers space and style, when you need it. ReachNow is a wholly owned subsidiary of BMW. As a free-floating car share service, users can pick up the car, drive it around, and park it in a completely different location, unlike your typical car rental program, or a car sharing service like Zipcar, where you have to return the car to the same location. ReachNow officially launched on April 8 in Seattle, making it the first North American city to gain access to BMW’s new car share program. Why Seattle? Well, for starters, the city has been incredibly supportive of free floating car permits, electric cars, and pushing for residents to use ride share programs. Plus, Seattle is a booming tech-industry with many major tech company headquarters and offices in the city—Microsoft, Zillow, Amazon and Google, to name a few. Right now, there are 370 BMW vehicles parked and ready to drive in Seattle. 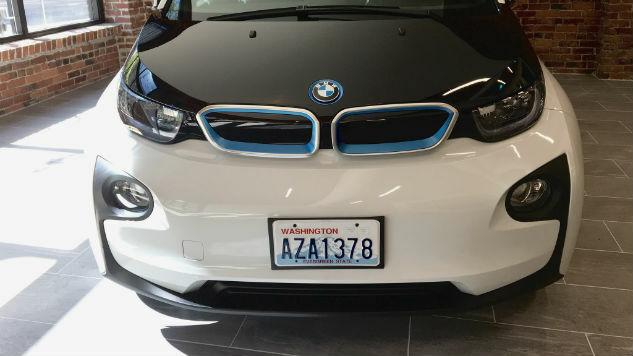 Sandra Phillips, chief customer officer of ReachNow, says one of the more competitive benefits BMW offers is a mixed fleet, consisting of a BMW 3 Series, MINI Cooper, and all-electric BMW i3 cars. Unknown to most people, this isn’t BMW’s first ride share program. The company owns a ride share service in Europe called Drive Now and also piloted a project in San Francisco under the same name. After pulling from their experience in both European and North American markets, BMW was able to find a model that worked and launched the idea in Seattle. Similar to how other ride share programs operate, like Car2Go, the whole experience is built through an app, which was built by BMW’s Silicon Valley start-up partner, Ride Sell. While users are primarily encouraged to use their phone to access the car, Cole notes registered users are also mailed a physical member card. Surprisingly, the registration process was as simple and easy as they said it would be. I was asked to create a unique pin so no one else could steal my drive off in the car under my name. I located a car in the app, walked to it (you have thirty minutes once you reserve a car to actually get to it and unlock it) and waited for it to open. Cole notes it takes a few seconds for the app to verify who you are before it will actually unlock the car—an important safety measure to prevent someone from stealing it. Once you hear that magic “click” sound, you’re in the clear and get to sit in the driver’s seat of a BMW. The app has a clean, neat design that pairs well with the smart-technology of a BMW. When I first sat in the car, I’ll admit I was a little overwhelmed by how different it looked than any other car I’ve ever been in. The breaks are sensitive, there’s a touch screen and I was almost waiting for the car to start driving itself. Cole asked if I’ve ever driven a BMW and I laughed, noting I’ve never been this close to one. ReachNow is currently running a promotional fare with free registration and rides, charging .41 cents per minute, but it will eventually charge a registration fee and increase fares to .49 cents. If you have to park and make what’s called a “stopover” to run inside for something or, say, go grocery shopping, you’re only be charged .30 cents per minute. Phillips also notes that you can rent the car for three, twelve or twenty-four hour periods at a discounted rate. Heading out of town for a few days? You can rent a BMW for your trip! Though ReachNow is only in Seattle for the time being, BMW looks to expand to ten cities by the end of 2017.